I am a second year student at Mount Royal University. Once I graduate I hope to work within the education system with troubled and vulnerable youth within the system who often get pushed aside. Currently for my practicum I am attending a junior high school working within the Bridges program. This program is to help integrate students into “normal” classrooms and to function “normally” within society. However I often find that these student are pushed to the back in terms of meeting their needs. I often see them pushed aside by other teachers and students as they are known to have emotional, cognitive, and behavioural problems and are considered a nuisance to the lifestyle of the school, which is quite disheartening. Due to this many of the students within the program have picked up on these actions and often refer to themselves as “losers” and say they are "pointless and no one cares" about them because they are “only Bridges students” When I hear them speak like this I do my very best to encourage them and let them know that they are important, smart, and significant. However my words can only do so much. So my question for you is: do you think it is possible to make a bigger awareness to the education system and changing it towards working with these vulnerable children instead of pushing them aside? I know I can make a difference to these children within the classroom and the environment they are in, but how can I go about ensuring that outside the classroom the environment is just as comfortable for them without trying to accuse or upset other staff members? I’ll be looking forward to your responses. I worked with a young person outside of the school system whose experience in school was almost identical to what you are talking about here. I don’t know if I have any magic bullets for teachers as those kinds of attitudes can be really difficult to challenge, especially within the power-dynamic of CYC-Teacher. What I did find incredibly helpful was to bring a social justice lens into the conversations that I was having with this young person. 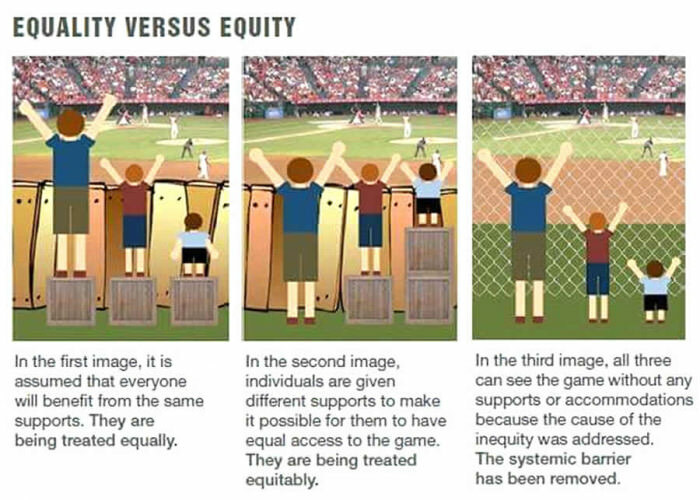 We started out having a conversation about equity versus equality versus barriers. There is this really great comic that someone drew that made it really understandable for young people, even for those with cognitive difficulties. The next thing that we did was we had a conversation about ableism. The situation that you are describing is a great example of ableism, these young people are presumed to be worth less because of their disabilities and perceived disabilities, and that they aren’t worth the extra attention and care that they need to do well in this environment. It isn’t that there is anything wrong with them, just that they need to do things differently or have things explained differently than other young people, and they deserve to have that need respected and met in all of the places where they are. I think however, that starting a discussion of ableism in schools can be powerful for young people because it is something that they can relate to on an emotional level, but depending on what these young people can understand it might not always be the best starting place. Other starting places that can be really good are asking them to think about when they see young people like them reflected in TV, and video games and movies and books, and ask them about those stories. Are they told always as an inspiration, do they only exist to make the able-bodied characters feel better about themselves? Do we ever know anything about these characters besides their disability? What do they think, what do they want, what are their dreams and goals? And it’s good to bring in both good and bad examples of disabled characters. A couple of good media references for disabled people are the new show Speechless which centers a young person who communicates using AAC rather than speaking, and has an attendant who is also his voice (and sometimes co-conspirator) and he is a bit older now (by which I mean it started about 5 years ago I think). Switched at Birth which features multiple deaf and some disabled characters all played by deaf and disabled actors (which is a huge deal since about 80% of the time deaf people you see on TV are not actually deaf). But from there it’s good to talk about what ableism in school looks like, how it makes them feel, helping them understand that ableism is the problem and not them. Especially if they are the ones feeling like they are the bad kids and the losers it can be really powerful for them to understand how that experience is rooted in systemic oppression. That being said, it’s worth warning you that the young person in question who I did this with felt very empowered to tell most of the adults in his life that they were being ableist and pointing out all of the places where he saw ableism (including the entire special education system) so, it is likely that the teachers may feel a bit attacked if some of the students in your class respond in a similar manner, but I don’t think that that is enough to stop doing it. It is ableism, and unless we name it and empower the young people to address it when it comes up in their lives they are the ones who pay the price for it because they think that there is something wrong with them. I’d rather give them the proper language and maybe some slightly more effective tools in addressing it than let them continue to think that they are the ones who are bad. And giving them that kind of language rather than “The teacher hates me” makes the dynamic of what is going on in the classroom a bit harder to ignore. It might actually be really helpful in terms of sparking dialogue with the teachers who really are passionate about wanting them to succeed in their classes but don’t know how. Those are my thoughts, but I’m not afraid to be an agitator. I know that your position there as a student might be such that this might not be a feasible intervention for you, but I wanted you to know that there are things that you can do, even if you don’t have any power whatsoever with the teachers themselves.